A 21-year study of senior citizens 75 and older, was led by the Albert Einstein College of Medicine in New York City, funded by the National Institute on Aging, and published in the New England Journal of Medicine. Their method for objectively measuring mental acuity in aging was to monitor rates of dementia, including Alzheimer's disease. The study was conducted specifically to determine if any physical or cognitive recreational activities influenced mental acuity. The non-physical part of the study was focused on activities such as reading, doing crossword puzzles, writing for pleasure, playing cards, playing musical instruments etc. The physical portion of the study focused on activities such as playing tennis, swimming, bicycling, dancing, golfing, walking and doing ordinary housework. The only physical activity with a profound impact on dementia was frequent dancing. In brief, the following activities were measured for their impact on dementias as a measure of prevention and improvement. The single greatest risk reduction of any activity studied. 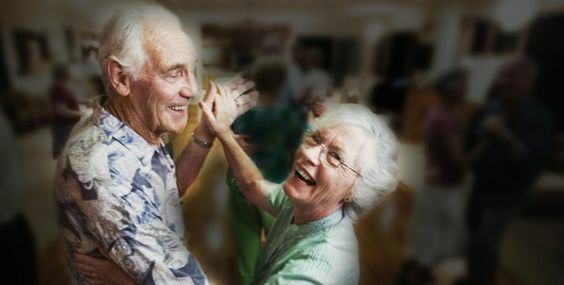 At BrightStar Care Delray Beach, we are pleased to have our own Judy Simon working with the Alzheimer’s community in Boca Raton, Delray Beach and Boynton Beach to learn and practice Ballroom Dancing. Judy trained with the Mark Morris Dance Group in Brooklyn, NY, a pioneer in dancing for Parkinson’s disease. MMDG runs its Parkinson’s dance program under its registered trademark Dance for PD®. “I am so pleased to be able to bring this cutting-edge program to Palm Beach County” said Amy Adaniel, owner of BrightStar Care of Delray Beach. “It’s great to have Judy on our team”. Amy is a tireless advocate for Alzheimer’s at the local and National levels, sponsoring, organizing and participating in Alzheimer’s events. BrightStar Care of Delray Beach is working with Alzheimer’s and Parkinson’s groups in Boca Raton, Delray Beach and Boynton Beach to bring the dance programs to patients and their families. See and hear more about Amy and BrightStar Care of Delray Beach on YouTube and at www.brightstarcare.com/brightstar-healthcare.